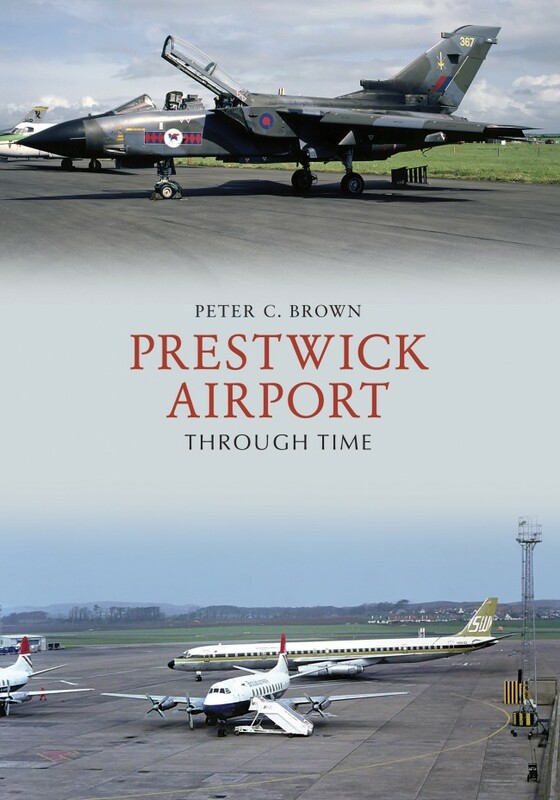 Prestwick Airport Through Time, Peter C. Brown, Amberley Publishing 2018; 978-1-4456-7769-9. For a large ('over 900 acres') facility adjacent to Prestwick and Ayr, Prestwick Airport is surprisingly unobtrusive. There are few passenger flights, though we understand that its freight business is of some importance, and its most noticeable intrusion is the deviation of the A79 around the perimeter of the main runway. Sheet 67 ('Ayr') one-inch map of the 1964 Ordnance Survey shows that this road from Prestwick to Monkton ran straight across the runway. The author notes that it was controlled by traffic lights until it was diverted in 1964. Then it was only the road traffic that had to wait at a red light. The recent decline of the airport means that it may be passenger planes that will face a light permanently set at red. With the cessation of passenger flights under consideration, this book is a timely reminder of the airport's place in aviation and local history. It is richly illustrated, with photographs of a great variety of planes that have touched down on its tarmac, some of the deserted check-in hall, and one of the former home of Charles Dalrymple of Orangefield with the control tower built on its roof in 1943. But it is more than a photographic compendium, with chapters in the text covering all periods of the airport's history, from the first flight from the site in 1913, through an important role in WWII to first growth and then decline in the succeeding decades.